If you’re trying to include more natural and organic foods in your diet, you won’t have to sacrifice eating healthy when visiting SoIN! Here’s a look at stores and restaurants offering nutritious and delicious dishes and products. Just saying the name “Seeds and Greens” makes you feel healthier! Opening October 2014, owner Stacey Freibert and staff take pride in selling local, high-quality organic and natural meats and produce. Seeds and Greens also supplies nutritional supplements, bulk spices and teas, and essential oils. The café serves wholesome and delish foods such as paninis, salads, and smoothies. Using fresh focaccia bread from a local bakery, paninis are filled with minimally processed meats and lots and lots of local, organic vegetables. Looking for a refreshing, nutritious pick-me-up? Seeds and Green’s smoothies are made with fruit, veggies, nut milk, protein powders, and superfoods. The Summer Snap smoothie is made with spinach, pineapple, peaches, and coconut milk- Yum! Ruben Freibert will teach how to make sushi on September 30 at 10:30 and at noon. The $18 cost includes a sushi rolling mat and rice paddle. Register at Seeds and Greens or call: (812) 944-3800. Learn how to use essential oils at Seeds and Greens on Saturday, August 19 at 11 a.m., and Tuesday, August 22 at 5:30 p.m. The classes are free. Since its opening in October 2011, Owner/Chef Rachel Smallwood prepares signature dishes using local, fresh ingredients. Serving breakfast and lunch, Orange Clover’s sandwiches, paninis, soups, and wraps are flavorful and colorful. For breakfast, try their grits. Flavors rotate daily and include cinnamon and sugar, cheeseburger, vanilla maple syrup, and cheddar cheese. For lunch, the spinach salad is protein-and- vitamin-packed with fresh spinach, feta cheese, walnuts, golden raisins, a boiled egg, apples and served with a honey mustard dressing. In addition to traditional deli sandwiches such as the Reuben, Cuban, BLT, Club, and Chicken Salad, Orange Clover has a Salmon Club sandwich with grilled salmon, bacon, lettuce, tomato, onion, and a delicious lemon aioli on a marbled rye bun. 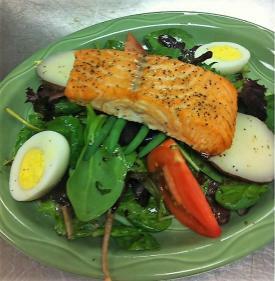 Featured below: a salmon niçoise salad. Want to have Orange Clover’s goodness at home or for your next event? They offer carryout, delivery, and cater. Orange Clover opened The Copper Room in 2016, an adjacent upscale dining or meeting space for a group of 60 or less. Click here for catering menus and pricing. Orange Clover has a “Clover Club” punch card which offers a free lunch after ten lunch purchases. Eat lunch at Orange Clover on Thursdays, and you’ll receive a double punch! When you’re shopping, dining, and having fun in SoIN, be sure to stay energized. To help you do this, Pearls on Pearl has added a sweet surprise to its shelves: honey! Owner Terry Lynch and husband Randy started New Albany Honey and Apiary in 2014. Pearls on Pearl carries New Albany Honey and honey products from local beekeepers. Why honey? Many tout raw honey’s wellness properties. Some people prefer honey over refined white sugar. It can be substituted for sugar in any dish. Commonly used in hot tea, honey also tastes great in coffee! Want to add a touch of sweetness to fresh fruits or vegetables? Honey complements produce. Honey is also an excellent energy source. For a convenient afternoon pick-me-up, Terry suggests a honey stick. Whether you use honey for its sweet taste, relief from allergies, arthritis, colds, or to boost weight loss or your immune system, New Albany Honey is a sweet addition to Pearls on Pearl. Interested in beekeeping? 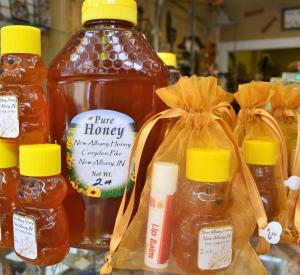 Hobby beekeepers can find New Albany Honey & Apiary bees and bee supplies at Pearl&apos;s on Pearl. Nucs (nucleus colony) and queens, beekeeping materials, and essential oils are available. 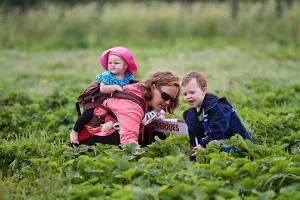 Randy Lynch breeds bees on the Lynch’s farm consisting of seven bee yards. From April through August, Pearls on Pearl sells New Albany Honey’s wild blackberry honey. Because it’s a popular seasonal honey, Randy has increased the number of hives near blackberry bushes. Extol Sports recently featured The Exchange Pub + Kitchen in its July issue. 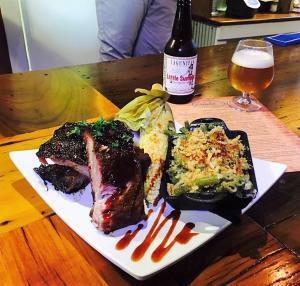 The downtown New Albany restaurant is serving a sizzling summer menu, using fresh produce, meats, and cheeses from local farmers markets and local farms. The restaurant also grows herbs and tomatoes in its own patio garden. View the magazine online here to read the article on pages 16-19. 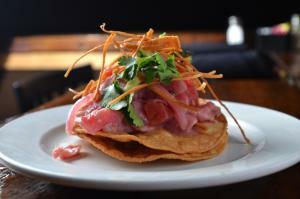 1894 Lodge in New Washington is serving an exciting new menu. The restaurant supports local farms by using fresh, hand-cut-steaks. It sources fresh produce and herbs from its own garden. Create your own Farm-to-Table meal!